Rama Krishana Paramhansa was born on February 17, 1836 at Kamarpukar Village of Hoogali disctrict in West Bengal. He was a great Sant always believed in unity & brotherhood, they spent their whole life towards attainment to know the god more precisely. They was pretty famous for their Ramakrishana Mission which was lead by their great pupil Swami Vivekananda ( Former of Hinduism in India. So I have picked up some of their beautiful quotes to inspire our readers. जब हम पीड़ित और गरीब होते है तब हम पूछते है, मैं ही क्यूँ ? लेकिन अगर हम अमीर और समृद्ध होते तो क्या हम पूछते, मैं ही क्यूँ ? Jab Hum Peedit Aur Gareeb Hote Hai Tab Hum Puchte Hai, Mein Hi Kyu? Lekin Agar Hum Ameer Aur Samradh Hote To Kya Hum Puchte, Mein Hi Kyu? 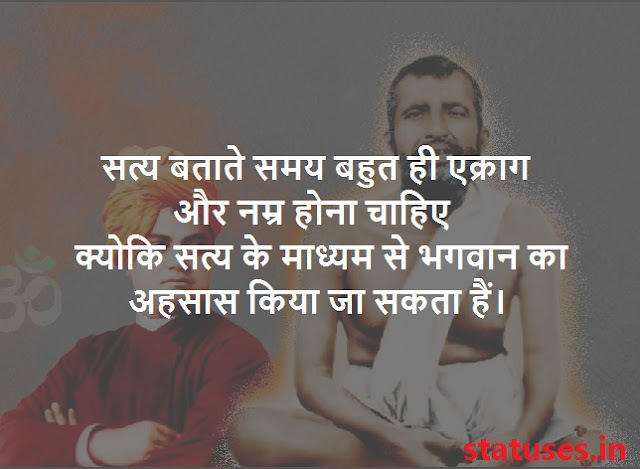 So these were few popular Ramkrishna quotes in Hindi, hope you liked them all. These were the most inspirational and devotional quotes I have ever read. Don't forget to share your collection of religious and Ram Krishna status in the comment section below, and dob't forget to share them on Facebook an Whatsapp. And do read our other hindi status, you can read about Ramkrishna Mission using the link.